The online Hispanic & Latino population in the U.S. is growing at 3x the rate of non-Hispanic whites and represent 35% of all population growth online in the U.S. (more than double their representation of the total population which is 16%). The chart below emphasized this. 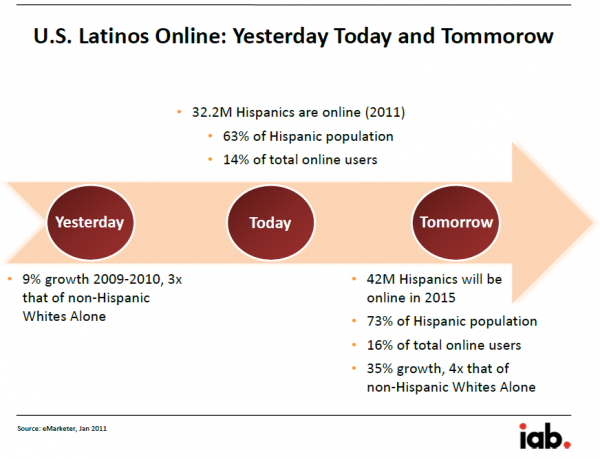 32.2 million Hispanics are currently online. This will reach 42 million by 2015. Banking: Why Engage Underbanked Hispanics to Differentiate? Dynamic Growth in Hispanic and Latino Purchasing Power in U.S.
© 2010- 2019 Copyright Spanish Language Domains.